Yesterday evening(May 11th) the Christian Dior Cruise 2018 Runway Show took place at the Upper Las Virgenes Canyon Open Space Preserve in Santa Monica, California. All of the celeb guests were wearing CHRISTIAN DIOR of course. Freida Pinto wore a blue jacket with a mesh bra underneath and a FALL 2017 moon & star beaded skirt and which we already saw the dress version on Charlize Theron. Frieda lined her skirt and it also featured a contrasting black wide waistband. For me, it's the waistband & shoe choice that doesn't work for me. A choker, the 'Lady Dior' bag and a pink lip finished up her look. Rihanna stepped out in the warm weather wearing a fur coat from the brand which she wore braless, belted & off-the-shoulder. It was styled with a RESORT 2018 black hat which made it's debut at the show, medium wash denim, black boots, statement jewelry and a embroidered bag. Kate Bosworth wore a black velvet dress, a black velvet clutch and logo slingback, kitten heel pumps. Kate's look doesn't excite but she looked pretty. Kelly Rowland rocked a cute braided hairstyle with a embroidered calf length dress a 'Lady Dior' small tote. Kelly arrived wearing a black leather jacket which she removed and also explains her shoe choice which I don't favor. Ankles up, I thought she looked great. Camilla Belle wore a navy FALL 2017 jacket and pleated silk-faille skirt which she accessorize with a pink embroidered clutch and logo slingback pumps. Silver jewelry and a colored lip finished up her look. Charlize Theron went the edgy, cool girl route rocking a black suede fringe coat, black skinny leg pants, sheer black stockings with LOUBOUTIN pumps, a black clutch and aviator sunglasses. 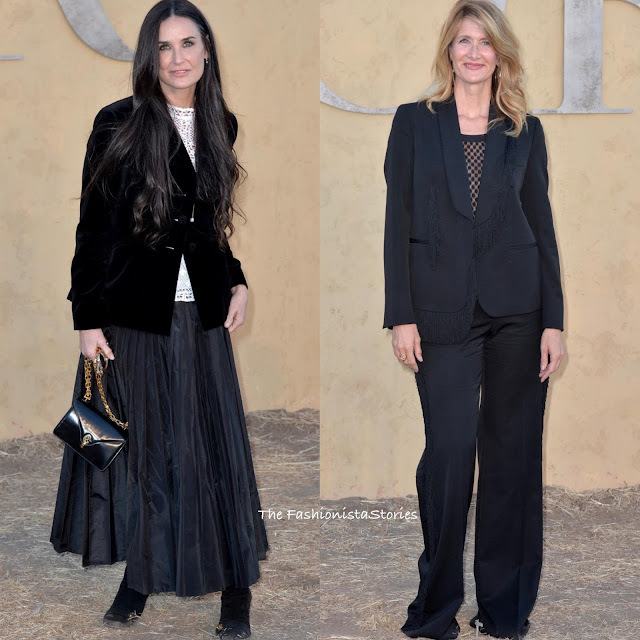 Demi Moore wore a black velvet jacket with a white lace embroidered top underneath and a FALL 2017 black silk-faille pleated skirt. A black chain strap bag and boots finished up her look. Laura Dern wore a black two-piece fringe suit with a sheer dotted mesh top underneath. This look had potential but the pants clearly needed to be hemmed better.